Helping you rock your busy mom life! For your convenience, this post contains affiliate links from Amazon.com and Target. This means if you click on a link and make a purchase, I make a small profit at no additional cost to you. Disclaimer: The sole purpose of this post is to compare the prices of various diaper brands. My intent from this post is not to persuade readers to choose the cheapest brand, but simply to give them information to make an educated purchase in regards to price alone. All prices were recorded from retailer websites on March 24, 2017. Having a baby is expensive, there’s really no way around it. Being a numbers gal, I ran all the numbers on various baby products to make sure that I was able to stretch our budget as far as possible. I’ll start by telling you that I had two babies in less than two years, which is why I had to be so focused on saving money, because to be honest, with daycare costs, our monthly budget can be tight. (If you want to read more about that, you can find out what I pay for daycare in this post). I just published The Master Guide to Buying Formula, which is a MUST READ for anyone with a baby or expecting one soon! In the near future, I plan to write similar posts about the prices of wipes and training pants. Make sure you subscribe to my blog, so you can hear when all these posts become available! Additionally, I’m working on a writing an eBook that will contain all my tips and tricks for saving money during your baby’s first year, as well as mom tips I learned and products I fell in love with along the way. I haven’t calculated it, but I would estimate I saved at least $3,000 with each child during the first year! Choosing a disposable diaper for your baby can be overwhelming. There are so many brands to choose from, and to make matters worse, most brands offer multiple styles. For example, Huggies has Snug and Dry, Snugglers, Little Mover’s, and Overnites. To make it even more complicated, there are different sized packages with names that don’t make any sense, like Jumbo, Giant, or my personal favorite “Family pack.” (What is the company trying to convey by calling it a family pack?!?) Then, as the size of the diapers gets larger, the price of the packages remain the same, but they contain fewer diapers. All of these things make it really hard to know if you are getting a good price for diapers. I wanted to help moms by letting them know the absolute highest price they should pay for diapers. As mentioned, the cost of diapers varies pretty widely between brands. So what did I do to help? I collected a whole lot of data (because let’s face it, the PhD researcher in me loves to crunch numbers!) First I selected 4 popular name brand diapers and researched their regular (everyday) prices for all the package sizes at different types of retailers. I even went to the extreme of looking at the prices for various sizes of diapers in each of these brands (newborn through size 6!) I then did the same thing for 6 popular store brand diapers. Determine if one type of retailer consistently has the lowest prices on various brands of diapers. Provide a price you should NEVER pay more than based on both brand and size. Compare the estimated annual cost of diapers based on brand to show how small price differences can add up over time. Over the past 2 years, I have bought a lot of diapers! I currently have two kids wearing size 5 diapers, which means that we not only buy a lot of diapers, but that saving money on diapers adds up! I put together “5 Easy Ways to Save Money on Diapers,” a document that contains the practical ways I personally save money on diapers and one special “system” I’ve developed that will save you money! I typically save nearly 25% off the “prices you should NEVER pay more than” (listed on this page). To get access to this document and other money saving tips, subscribe to Super Savvy Sarah! Before getting to the results, let me explain how I selected the brands of diapers and retailers. I wanted to select a variety of name brand and store brand diapers at different price points. For name brands, I chose Honest, Huggies Snug and Dry, Luvs, and Pampers Baby Dry. I chose Honest to represent a higher cost, eco-friendly diaper. Huggies, Luvs, and Pampers were selected because they are three of the most recognized brands of diapers. Additionally I randomly selected one “style” from each of these brands, because I assumed that the observed price trends would be similar across all styles from that brand. In regards to store brand diapers, I tried to choose popular brands that were representative of different types of stores. Therefore I chose Walmart and Target to represent supercenters, Costco and Sam’s Club store brands to represent warehouse clubs, CVS to represent drugstore brand diapers and Aldi brand to represent discount grocery stores. Before we get to the results, let me explain how I determined the “prices you should NEVER pay more than for diapers.” I used each retailer’s website to look up their prices for various sizes of packages. I then calculated the cost per diaper (CPD) so that I could get a valid price comparison. To do this I simply took the price and divided it by the total number of diapers in the package. I found that the price for Pampers Baby Dry Diapers Size 1 diapers ranged from 0.16 – 0.23 per diaper based on the package size and the retailer. The cheapest price for Size 1 Pampers Baby Dry diapers is 0.16 per diaper. This is the absolute highest price I would ever pay for these diapers, but we will talk more about that in a second. As mentioned, I did a lot of research for this post. I spent hours looking up prices at various retailers for all the sizes of name brand diapers, but I did this so you wouldn’t have to! (As a mom, I am always short on time!) I am going to summarize my findings for you, so you can reap all the benefits from this ONE article and reference it anytime you need to buy more diapers! As with most purchases, buying in bulk always yields lower diaper prices. That being said, bulk basically means any package bigger than the Jumbo size. To make it easy on you, Jumbo packages are the ones that are in the plastic bags. NEVER BUY the plastic bag of of diapers, they always are the highest price per diaper. By comparing the prices for the name brand diapers at 8 different retailers, I consistently found that Target and Walmart had the lowest prices (there were occasions where other retailers were cheaper, but for a majority of instances, Walmart and Target were the cheapest). Remember, I only collected regular prices, not sale prices. If you are a frequent Target shopper you know that Target routinely has great sales on diapers, whereas Walmart advertises “everyday low prices.” (and hence, typically no sales). Additionally it’s worth noting that I didn’t include Amazon’s prices in this study. The main reason for that is because I am an affiliate of Amazon, they do not allow me to publish prices that can fluctuate. I however would like to encourage you to routinely check the Amazon Mom page, because when you subscribe, you save 20% off of regular prices and sometimes there are additional coupons available. Click here to check out the current diaper prices on Amazon . Here are the results I’m sure you have been waiting for. Here is the table that shows the prices you should NEVER pay more than for diapers, based on a variety of brands and sizes. The punchline of this is: Don’t buy diapers unless the price per diaper (price of package divided by diaper count) is equal to or lower than this value. These are “good” everyday prices, not sale prices. Many of the retailers I investigated do have sales or will price match. So in your head, note the brand and the size you want to buy, then refuse to pay more per diaper than this price! To reference when you are out shopping, the table shown below and a SUPER convenient diaper calculator tool can be found on this page. What do these numbers all mean? Here’s some perspective! Looking at the table above can be daunting. But let me give you some perspective on how a small price difference can add up. Let me start by telling you that a 1 cent difference in diaper prices translates into roughly $30 annually (a few pennies can add up to you having a couple more nice dinners out with your significant other!). Now I will show you how much the annual cost varies between the different brands over the time frame of a year. To do this, let’s make the assumption that you use size 3 diapers for a year and on average your baby goes through 7 diapers a day. This is what you will spend per year on diapers. As with anything you buy, it is very important to know what a good price is. You can’t comprehend a good deal, if you don’t have a baseline price. I hope you will use this post as a reference, so when you are out at the store and you see diapers on sale, you will easily be able to determine if they are worth buying. As with anything you buy, it is very important to know what a good price is. You can’t comprehend a good deal, if you don’t have a baseline price. The table summarizing “the prices you should never pay more than for diapers” and a SUPER convenient diaper calculator tool can be found on this page. I have summarized the most practical ways I have found to save money buying diapers. 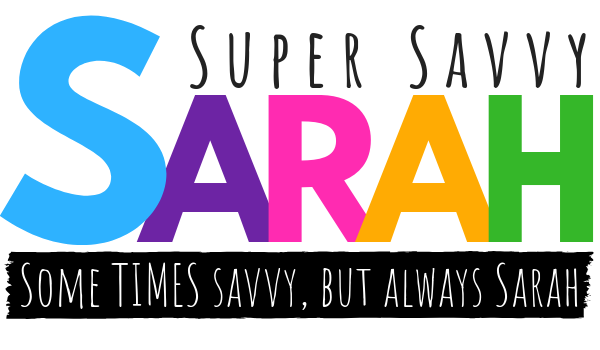 To gain access to “5 Easy Ways to Save Money on Diapers,” subscribe to Super Savvy Sarah! This document contains the practical ways I personally save money on diapers and one special “system” I’ve developed that will save you money! Super Savvy Sarah is a participant in the Amazon Services LLC Associates Program, an affiliate advertising program designed to provide a means for sites to earn advertising fees by advertising and linking to Amazon.com. Thanks for the 4 tips, very handy! I can’t wait to see your next blog!! Thanks Corrin, I’m glad you found the tips helpful! Have a wonderful day! Thank you – very helpful! Have you collected the same information on pull ups/easy ups? Hi Amy! I haven’t, but that is a great idea! I will put it on my list for the near future, as well as formula and wipes! It’s crazy how fast little things add up, isn’t it? My gut instinct would be to tell you to buy them at Target, when they run one of those get a free giftcard with any purchase over $X, and use a Redcard to get 5% off on top of that, but can’t say that with absolute certainty! I’m a first time mom. Thank you so much for all your research, this is so helpful! In addition to raising two young boys, I work full time as a professor and do my best to manage our household! I have an amazing husband who is in the middle of his education journey, which means I am the one that makes our family’s world go round! I am a freezer meal expert and love finding practical ways to get it all done and save some money!